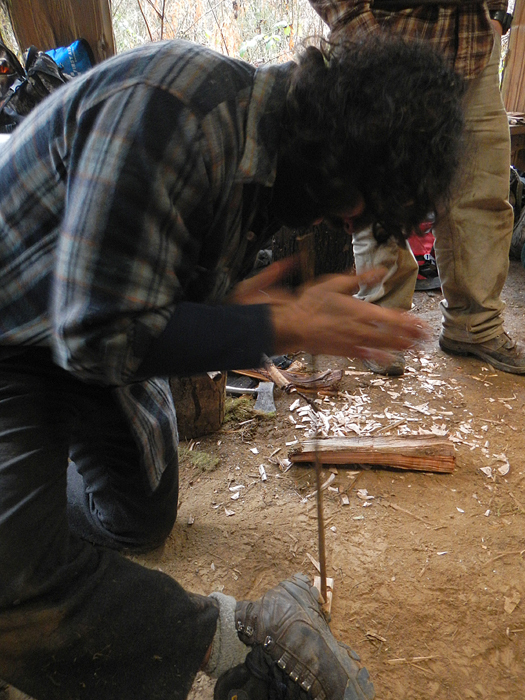 The final two weeks of February were pretty packed with lots of different skills at the Wilderness Certification Program, including lessons in nature-based education, permaculture and advanced fire skills. During one class day, students practiced their fire skills and worked with advanced techniques, including the hand drill method. Here Alderleaf student Elan shows us how its done, while instructor Steve looks over his shoulder. Notice the way Elan holds the board with his foot. 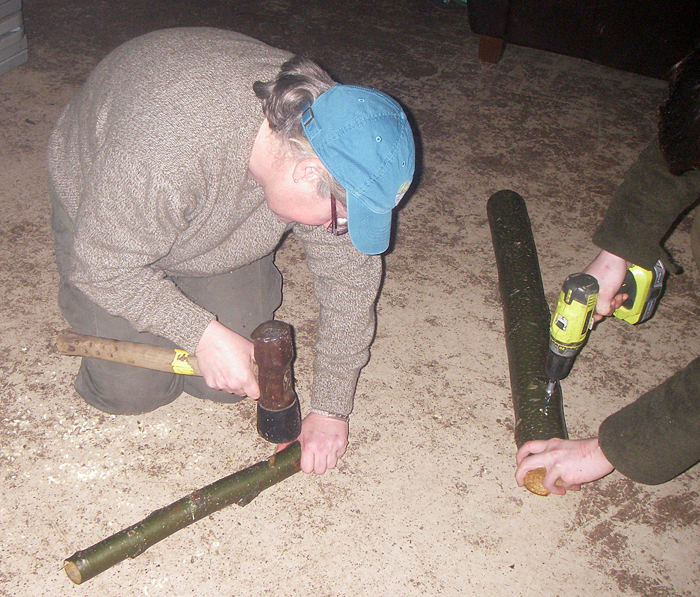 This method of holding the fire board down takes a bit of flexibility. Here two students inoculate some fresh alder logs with mycelium-infused wooden dowels during a permaculture class. Ethan (on the right margin) drills holes for the dowels, while Sammy pounds them in gently using a hammer. Then the logs are pilled up in a structure that resembles a log cabin, and left in a cool, shady, moist place to allow the mushroom mycelium to spread. In a few months or so, we should see some fruiting mushrooms! On another class day during a nature-based teaching class, some students were challenged to do a blindfolded exercises to get more in tune with their other senses. 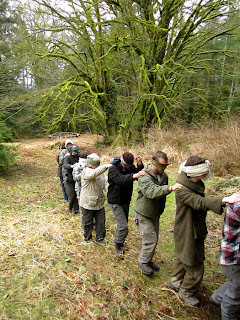 This included a blindfolded string walk through the forest at Alderleaf. They had to find their way over, under and around obstacles using only their other senses and with the string as their guide. 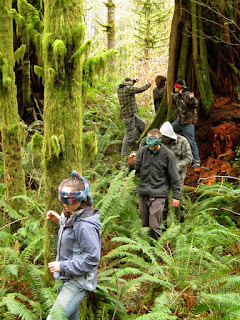 Students are lead to their blindfolded string walk course in the mossy forest at Alderleaf. 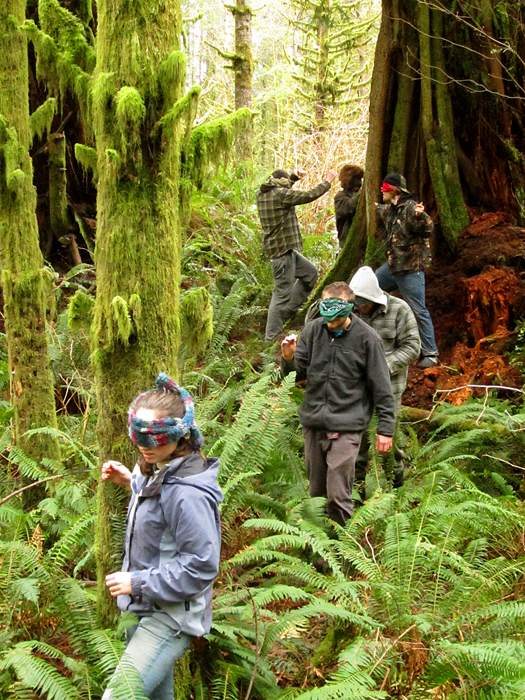 Here students walk carefully along the string course through the vibrant green, overgrown forest landscape. As they move slowly, the sounds of the forest pop out more clearly and their sense of touch leads them through a diverse world of textures and obstacles. Watch for another update about the Wilderness Certification Program very soon from the final week of classes before spring break!